You only have to observe a child interacting with an animal to understand how great that relationship can be. 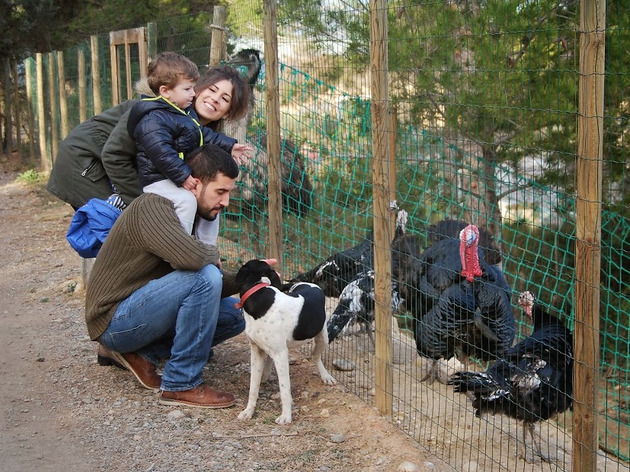 You can see for yourself at the Granja d’Aventura Park, an educational and fun project for families to enjoy together, being in contact with animals and the natural surroundings of Viladecavalls, about two kilometres from Terrassa and a little bit more than a half hour from Barcelona by car. Even though it’s close enough to the city, as soon as you get to the farm, surrounded by small woods and fields, you feel like you’re in the middle of nowhere — in a good way. Inside the farm, there is no set path or route to follow. 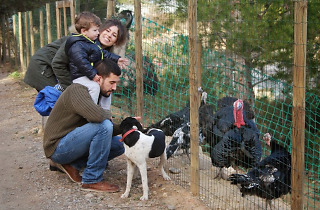 The idea is that the families can move freely throughout the park, visiting and touching the bunnies, chickens and pigs that live there; getting to know inhabitants of the farm through experience and contact. Get a wet kiss from Ramona, the cow that thinks she’s a dog, and find out for yourself that angora goats smell like cheese (goat’s cheese, of course). The most daring can touch the snakes, spiders and other exotic animals, always under the supervision of trained farm staff. All of the animals live in sustainable facilities, constructed with organic and recycled materials. Environmental consciousness is a key and central element to the project, as is the vegetable garden area (which is partially closed during the summer), where they also host workshops to learn about food cycles and seasons. The most unique thing about this farm, however, is that between the spaces where the animals live, there is a vegetable adventure park with two spaces that separate under five from the older kids; it features zip-lines, swinging vines, bridges and nets between the trees. The farm team swears that more than a few children have had to ask their parents to stop playing so they could play themselves.